Transatlantic records have been broken by the “Rex” and the “Conte di Savoia” of the Italia Line. These two vessels are the largest and fastest of the Italian luxury liners which ply between New York and the Mediterranean. 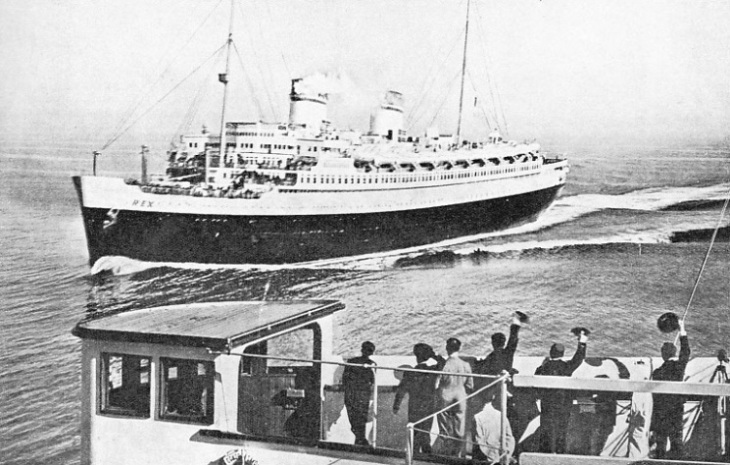 A WELCOME FROM THE BRIDGE of the Conte di Savoia to the Italian liner Rex at speed. The Rex, 51,062 tons gross, was completed in 1932. She has a length of 879 ft 11 in, a beam of 102 feet and a depth of 30 ft 8 in. Designed for a speed of 27¼ knots, she broke the record for the westbound Atlantic crossing in August 1934, with an average of 28.92 knots between Gibraltar and the Ambrose Light, New York. The previous holder of this record was the Conte di Savoia. TO many people living in Great Britain a transatlantic crossing means a voyage between Southampton and New York. Though they may be aware of the existence of other routes, such as those from Southampton to Canadian ports or from Liverpool or Glasgow to North and South America, they are inclined to think of the Southampton-New York route as preeminent. The reason is that most of the crack Atlantic liners of Great Britain, France and Germany use the Southampton-New York route. There is, however, between the North American continent and Europe, an important service which is not primarily concerned with the seaports of northern Europe. New York and Naples are connected by a direct express steamer service maintained by two of the most up-to-date liners operating to-day. They are the Rex and the Conte di Savoia, of the Italia Line. These vessels are speedy as well as modern, for both have broken records and the Rex has held the Blue Riband of the Atlantic. The Italia Line is an amalgamation of several important concerns, including the Navigazione Generate Italiana, the Cosulich Line and the Lloyd Sabaudo. Its record-breakers are the largest vessels in an extensive fleet. The route taken by the Rex and her sister involves the crossing of the Atlantic from New York to Gibraltar, or vice-versa. Two calls are made in the Mediterranean before the liner reaches the end of her voyage at Naples. These are at Nice, on the French Riviera, and at Genoa, on the fringe of the Italian Riviera. Thus the service is especially attractive to those Americans who respond to the appeal, of this enchanting part of the Mediterranean coast, as well as to those who are irresistibly drawn by the lure of Italy. Apart, however, from the tourist and seasonal trade, there is a constant and important business traffic. As large numbers of Italians live in or have business with the United States, the value of the link will be appreciated. The voyage between New York and Genoa is made in six and a half days. The Rex, elder of the two vessels, was built by the Ansaldo Yard at Sestri Fonente, in the Gulf of Genoa, and was completed in 1932. Her gross tonnage is 51,082. She is 879 ft 11-in long, with a beam of 102 feet, and a depth of 30 ft 8-in. The height from the keel to the bridge is 120 feet. These dimensions, the latest from official Italian sources, differ slightly from others previously published. The designed speed is 27½ knots, but the Rex has proved herself capable of a considerably faster rate. When she broke the record for the Atlantic crossing on the trip completed on August 16, 1934, she averaged 28.92 knots between Gibraltar and the Ambrose Light, New York. She had followed the official North Atlantic steamship track for vessels bound for the United States. To enable the Rex to maintain her high rate of speed she is fitted with four screws, each of them driven by a triple-expansion geared turbine. The total shaft horse-power is 120,000. The liner has a raking bow and a counter stern. Her two funnels are oval, or rather streamlined, with a greater diameter of 46 feet and a lesser diameter of 21 feet. Either funnel rises to a height of 51 feet above the top deck, or Sports Deck. There are eleven decks, some of which run the whole length of the ship. The Conte di Savoia has many points of resemblance to the Rex, but she is not identical in design. Launched on October 28, 1931, by H.R.H. Princess Maria of Piedmont, the younger ship was built by the United Adriatic Shipyards at Trieste, the famous seaport at the head of the Adriatic. The Conte di Savoia has a gross tonnage of 48,502. Her length is 814 ft 7-in, her beam 96 feet, her depth 32 ft 5-in, and her draught 31 ft 2-in. The height from the keel to the bridge is 113 feet. Her designed speed is the same as that of the Rex. In May 1933 she secured the westbound record with 27.53 knots from Gibraltar to the Ambrose Light, New York. She held this record until August 1934, when it was taken from her by the Rex. The Conte di Savoia, also, is a quadruple-screw ship with a triple-expansion turbine on each screw. She has a raking bow, but a cruiser instead of a counter stern. I n the same way as the Rex, she has two streamlined funnels, either with a greater diameter of 43 feet and a lesser diameter of 23 feet. These are taller than the funnels of her sister, as their height above the Sports Deck is 56 feet. AN EXCLUSIVE FEATURE OF THE CONTE DI SAVOIA is the stabilizer, adopted for the first time in a large passenger liner. 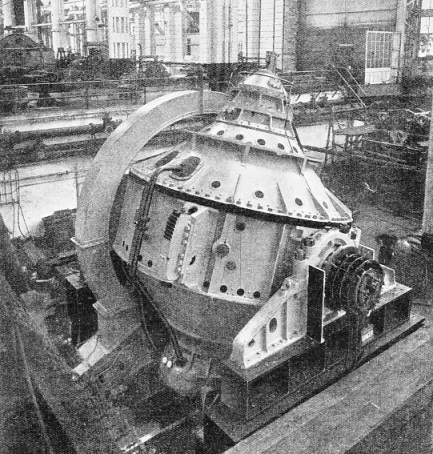 The stabilizer, which was made at the Vickers-Armstrong works at Barrow-in-Furness, Lancashire, consists of three Sperry gyroscopes of equal dimensions. Each gyroscope has a fly-wheel weighing 175 tons and making 910 revolutions a minute. The total weight of the device is 750 tons, and the horse-power absorbed is 2,000. It is claimed that the stabilizer eliminates rolling more than five degrees (two and a half degrees to either side), even in the roughest weather. An exclusive feature of the Conte di Savoia is the provision of a stabilizer. This device has been adopted for the first time in a large passenger liner. The stabilizer in the Conte di Savoia consists of three gyroscopes, of the Sperry type, of equal dimensions. Each gyroscope has a fly-wheel weighing 175 tons and making 910 revolutions a minute. The total weight of the stabilizer is 750 tons, and the horse-power absorbed is 2,000. It is claimed that, with the stabilizer in operation, the vessel will not roll more than five degrees (two and a half degrees to either side) even in the roughest weather. Those who are afraid to take a sea voyage for fear of sea-sickness should therefore have no qualms about booking in the vessel. Some idea of the capacity of these two ships will be obtained from a study of the passenger accommodation. At first four classes were provided in either vessel - first class, special class, tourist class and third class, but now the special class has been merged in the tourist class. The term “special class” may sound a little mystifying; but its adoption was due to an almost universal prejudice on the part of the travelling public. There are few people who do not regard the expression “second-class” as a term of disparagement. Mediocrity may be golden, but it is certainly uninspiring. Railway managers long ago found this out and British trains, with few exceptions, are first and third class only. When second class was generally abolished, the logical course would have been to label all the “thirds” as “seconds”, but that, though logically impeccable, would have been a psychological blunder. In the same way, shipping companies are fighting shy of second class. The Italia Line evolved a brilliant substitute for the hated denomination, and special-class passengers took pride in accommodation for which second-class passengers might have made excuses. Now that special-class accommodation is available for tourist-class passengers in either vessel, the tourist-class passenger in the Rex or Conte di Savoia is particularly well served. The Rex can accommodate 378 first-class, 788 tourist-class, and 866 third-class passengers - a total of 2,032. The capacity of the Conte di Savoia is 360 first-class, 778 tourist-class and 922 third-class passengers. The slightly higher total - 2,060 - is mainly due to the relative preponderance of third-class accommodation in the newer vessel. Thus when either ship is full, she has the population, of a large village. It is true that this population is congregated for less than a week or so, but it requires during that period the services of a large crew, in the Rex this totals to the surprising figure of 732, or just under one employee to three passengers. The Conte di Savoia can manage with a crew of 651. In the Rex’s total of 732 there are fifty-one officers. Under the Commander there are the Staff Captain, seven deck officers, the Chief Engineer and twenty-four engineers, two Chief Electricians, the Chief Purser and four pursers, three inquiry and travel office clerks, four Marconi operators, two doctors and a chaplain. The Conte di Savoia has one more officer, as she is provided with five instead of four pursers under the Chief Purser. The deck hands number eighty in the Rex and seventy-eight in her sister. The figures for the engine-room crew are 112 and seventy-four respectively. In either vessel the Chief Purser has an enormous staff under his care - 380 in the Rex and 360 in the Conte di Savoia. The respective kitchen staffs are fifty and forty-eight. It is interesting to examine the make-up of the Chief Purser’s staff. That of the Rex will serve as an example. The average landsman seems to think that a liner's staff consists mainly of stewards. Most passengers find the services of a steward invaluable when they are well and indispensable when they are under the weather. There is therefore some excuse for their preoccupation. In spite of this, the total number of stewards and stewardesses in the Rex - 164 - is less than half the total of the Chief Purser's staff. There are two head waiters and two assistant head waiters. Six barmen need the assistance of 112 assistants. Coffee is so important in an Italian liner that there are four “coffee-cooks”. Eleven musicians provide the personnel for the ship’s orchestra. Passengers who are particular about their clothes will be glad to hear that there are three wardrobe keepers, a tailor’s presser, a laundryman and three women starchers and ironers. Hairdressing and its cognate crafts are in the hands of two ladies’ hairdressers, five barbers and one manicurist. A miscellaneous list of trades includes two gymnasium stewards, two photographers and three printers. The printers produce the ship’s newspaper, the Corriere del Mare (“Sea Post”), which is a daily publication. Finally, there are fifteen firemen to deal with any emergency in their sphere. The kitchen staff, under a chef assisted by a second chef, amounts to eighty-nine. There are thirty-one cooks and five pastry cooks, an ice-cream maker, a cellarman. two butchers, five provision storekeepers, six bakers, and no fewer than thirty-six washers-up. We have already referred briefly to the propelling machinery in the Rex and the Conte di Savoia. To provide steam for the four independent groups ot turbines, the Rex has fourteen boilers and her sister thirteen. In the Conte di Savoia ten of the boilers are of the water tube type and supply steam to the propelling machinery, three cylindrical boilers are for the auxiliary machinery. This consists of four turbo-dynamos, two diesel-dynamos and two emergency diesel-dynamos, besides pumps for various purposes and a “Thermotank” apparatus for the ventilation and heating of rooms. The eight auxiliary dynamos have an output of 5,300 kilowatts, enough to light a town of the size of Southampton (population 176,000). The number of electric lamps in the ship is approximately 18,000. The Rex has three turbo-dynamos and four diesel-dynamos, producing a total of 4,620 kilowatts - an appreciably lower figure than in the Conte di Savoia - but she has 2,000 more electric lamps. Up-to-date navigating and steering appliances are installed in either vessel. The Rex has an Oertz streamlined rudder weighing 100 tons; that of the Conte di Savoia - also an Oertz rudder - weighs 75 tons. Comprehensive safety appliances have been equipped in the two ships. The Rex is divided into fifteen water-tight compartments by fourteen bulkheads, fitted with water-tight doors worked on the hydraulic system from the bridge, with special signalling apparatus. The Conte di Savoia has thirteen water-tight compartments and twelve bulkheads, with water-tight doors similarly worked. her depth 32 ft 5-in. In either ship the driving machinery is divided into numerous water-tight compartments, thereby ensuring that one-half of the boilers and turbines, as well as the most important auxiliary plant, can continue working, even in the event of serious damage to the vessel. Since the Titanic disaster in 1912 the provision of sufficient lifeboats has engaged the closest attention of the authorities in every civilized country. Either of the two Italian liners has lifeboats of the most up-to-date description and adequate capacity. The Conte di Savoia’s equipment, in particular, is worth close study. She has twenty-six lifeboats, of which twenty-two are of the Fleming type, hand-worked by levers. Each is capable of holding 137 persons. There are also two motor launches either capable of holding thirty-four, and two pulling boats, either holding thirty-one persons. The total accommodation of the lifeboats is considerably in excess of the maximum -capacity of the ship. Fireproof bulkheads, of which there are eight in the Rex and twenty in the Conte di Savoia, minimize the risks of fire at sea. Every fireproof bulkhead is fitted with fireproof doors. In the newer ship the fire-preventing and firefighting apparatus comprises fire-alarm, smoke signallers, automatic electric alarms and glass-covered electric alarms. There are 128 fire hydrants in the passengers’ and crews’ quarters, and eighty-eight fire hydrants in the engine-rooms and in exposed parts of the ship. There are 120 fire-extinguishing devices situated in a place called the “signal, centre”, in addition to other devices and appliances under the control of fifteen firemen, part of the staff under the Chief Purser. The Rex and the Conte di Savoia have comprehensive wireless telegraphy installations. The Conte di Savoia has a radio-telegraphic long-range transmitting and receiving station (long and medium wave type), a short-wave radio-telegraphic station, an automatic radio-telegraphic transmitter for SOS signals, a wireless telephony transmitting and a wireless telephony receiving station. The normal range of these sets allows of direct communication with North America immediately after the ship has left Italy, and with the principal European towns from the United States coast. The liners are fully and luxuriously equipped, but the Conte di Savoia will receive detailed attention in this chapter as she is perhaps even more completely fitted than her sister. The scheme of decoration is particularly fine, being the work of the Italian architect Gustavo Pulitzer Finali, of Trieste. The Sun Deck gives access to a large open-air swimming pool, flanked by wide terraces and gangways. The Sports Deck contains the bridge, forward, the chart room, the wireless station, and the appropriately named Lido. Here are other entrances to the swimming pool, the Lido Cafe and Restaurant and the shooting gallery. This deck, except for a small section at the after end and at a lower level, is reserved for first-class passengers. FROM THE SUN DECK AND THE SPORTS DECK access is obtained to the open-air swimming pool in the Conte di Savoia. 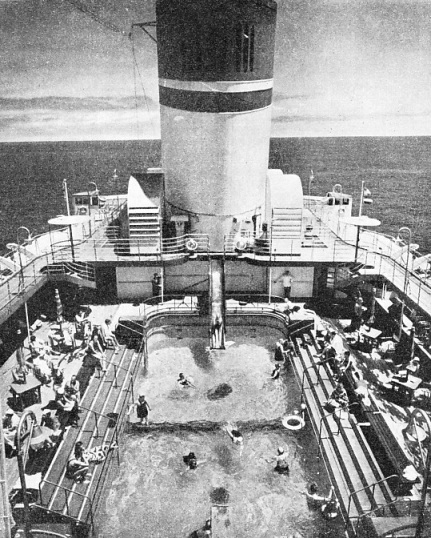 The swimming pool is a feature of the ship’s Lido, which includes also the Lido Cafe and Restaurant and the shooting gallery. Most of the Sports Deck is reserved for first-class passengers. The streamlined funnels of the Conte di Savoia - one of which is seen in the photograph - reach to a height of 56 feet above the Sports Deck. Either funnel has a greater diameter of 43 feet and a lesser diameter of 23 feet. In the forward end of the Promenade Deck is a belvedere, so called because it commands an uninterrupted view of the sea, Between the funnels is a veranda. The Grand Open-Air Promenade is 918 feet long, and averages about 16 feet in width. It extends all round the deck. On the Promenade Deck also are eight veranda suites and some first-class staterooms. There is a fully-equipped gymnasium, with an adjoining Roman bath. On this deck are some of the ship’s boats, the Commander’s cabin, and various offices. The Social Deck, mainly reserved for first-class passengers, is one of the most important in the ship. Right forward is another belvedere. Next to this is the Winter Garden and, behind it, the Club, with bar and dance floor. From the two entrances to the Winter Garden there extends aft on either side of the vessel the Enclosed Yeranda, 984 feet long and 16 feet wide. It is protected from the weather by glass screens. Leading aft from the Club, on the port side, are the card room and, on the starboard side, the Princess Gallery, giving access to the lounge, foyer and writing room. We now reach the most striking feature of the ship - the Grand Colonna Hall. Although elsewhere in the ship the keynote of the decorations is modern, the claims of the antique have not been forgotten here. The Grand Colonna Hall is named after the famous gallery of the Colonna Palace in Rome, dating from 1620 and incorporating ancient Roman marble and sculptures. The hall is divided into a nave and two aisles. On the ceiling is a reproduction of the painting in the Colonna Gallery by Lucchesini of the battle of Lepanto. The apartment is decorated with a profusion of marble pilasters, classical sculptures, friezes and cornices in the style of the seventeenth century. In the hall is a bronze bust by Mariya Lednicka of H.R.H. Princess Maria of Piedmont, sponsor to the vessel. The total floor area of the Grand Colonna Hall is 5,918 square feet and its height is 24 feet. The central space is reserved for dancing. Opening out of the hall are the first - class buffet-bar and the Chapel. Although the Chapel is situated in the first-class part of the ship, it is accessible to passengers of all classes. In the after end of the Social Deck are the first-class Winter Swimming Pool, with a gymnasium and bar adjoining, and the Sports Deck, tourist class, with a dais for fencing and boxing. In the forward part of A Deck is the third-class Sports Deck. There follow a large number of first-class staterooms. On this deck also are the first-class Grand Entrance Hall and a tourist-class entrance hall. Tourist-class accommodation on this deck includes two verandas, 360 feet long and 16 feet wide, a smoking room with bar, reading and writing rooms, the saloon (with a floor area of 3,228 square feet), the ladies’ saloon, the promenade, and numerous cabins. On B Deck, forward, are a third-class promenade, winter garden, veranda and bar. Then come more first-class staterooms and cabins, the Grand Entrance Hall, first-class (extending to A Deck), another first-class entrance hall, with a shop and show-window gallery. Farther aft is a tourist-class entrance hall, similarly extending to the deck above. Grouped round this hall are more tourist-class cabins. 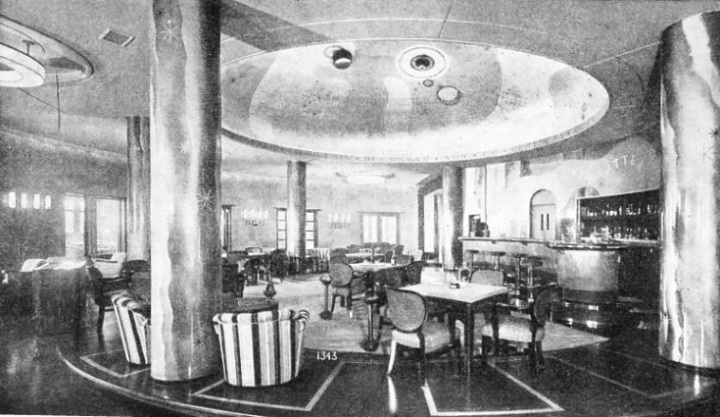 Aft of these are another tourist-class entrance hall, with bazaar, another tourist-class smoking room and bar, and verandas and promenade of the same class. Passengers of all three classes are accommodated on C Deck. Forward are third-class cabins, the main third-class promenade, 492 feet long and averaging 13 feet wide, and the third-class Dining Saloon, communicating with smoking and ladies’ rooms. Aft of this is the third-class entrance hall, with various shops. Then come some more first-class staterooms, on either side of an exhibition arcade, with show - windows. This leads into the first-class Dining Saloon, situated abaft the centre of the ship. Leading out of this apartment are a small saloon and the children’s dining saloon, also first-class. In the after part is the tourist-class Dining Saloon. 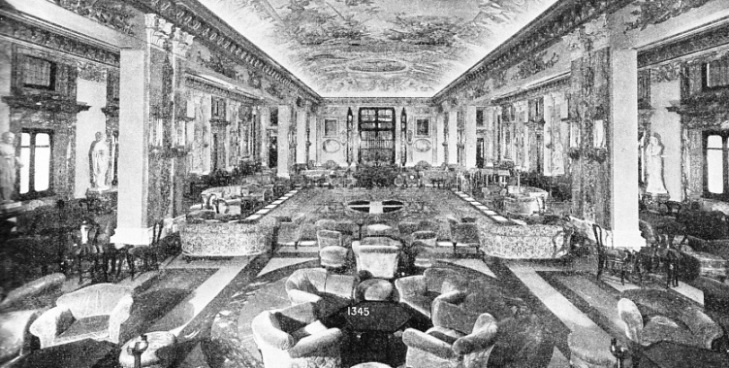 The decorations of the first-class saloon are enhanced by the marble of the walls, which reflects the diffused lighting from the ceiling and from concealed points round the entrance. The remaining three decks are given over mainly - as far as passenger accommodation is concerned - to cabins. On D Deck, on the port side only, are tourist-class and third-class cabins On E Deck are numerous third-class and tourist-class cabins, the latter being aft. Amidships is a motor-car garage. The main baggage room is on this deck. F Deck, the lowest but one, has room for a few third-class cabins forward and for rather more tourist-class cabins aft. The nethermost deck, G Deck, is largely occupied by the engines and boilers. It contains also the stabilizer already mentioned, as well as holds for special cargo, mails and the like. Passenger accommodation in the Rex is equally suitable and lavish, but the lay-out is somewhat different. THE GRAND COLONNA HALL in the Conte di Savoia is the most striking feature of the ship. The hall takes its name and the spirit of its decorations from the gallery of the seventeenth-century Colonna Palace in Rome. The nave, flanked by two aisles, is decorated with marble pilasters, classical sculptures, friezes and cornices in the style of the seventeenth century. On the ceiling is a reproduction of the painting in the Colonna Gallery by Lucchesini of the battle of Lepanto. The total floor area of the hall is 5,918 square feet, and its height is 24 feet. This week’s cover shows the Rex, belonging to the Italia Line. 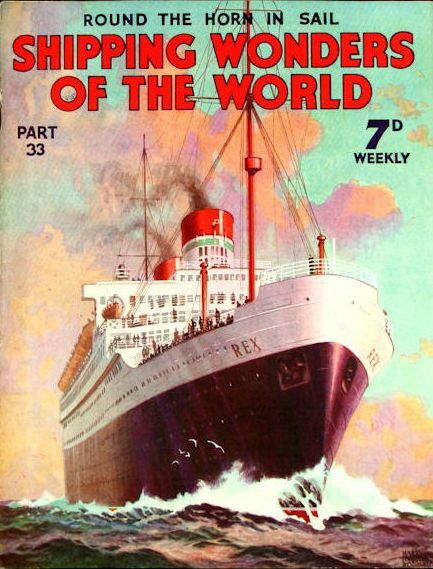 The Rex, a quadruple-screw turbine steamer of 51,062 tons, won the Blue Riband of the Atlantic in August 1934, when she averaged 28.92 knots from Gibraltar to Ambrose Light, New York. The illustration is by Harry Hudson Rodmel. The Rex also appeared as the fifteenth article in the series Merchant Ship Types (Part 20).